As a full-time mom I often find myself laughing at questions like "what do you do all day at home?" or "so what are your plans for the week?" or "aren't you bored and lonely without a job?" etc. The absolute best was once at an out-of-town event one evening, a women from the community introduced herself and asked me where I was from. When I responded she then asked me "what do you do there?". I smiled warmly and said "I live there". Last September I spent the month in the Hebrew Academy pre-K classroom filling in for the teacher who has just had a baby and was still on maternity leave at the start of the year. While working with a lesson plan book, I was struck by how incredibly easy and seamless the days went when I had every project, activity, and lesson plan written out in time slots. I never had to scramble, search, or wonder what to do for the next 15 minutes. It was blissful. And in those weeks I decided to take this little strategy back with me, to my toddler and our days spent together. I've always been a planner, a list-maker. I totally have listamania. 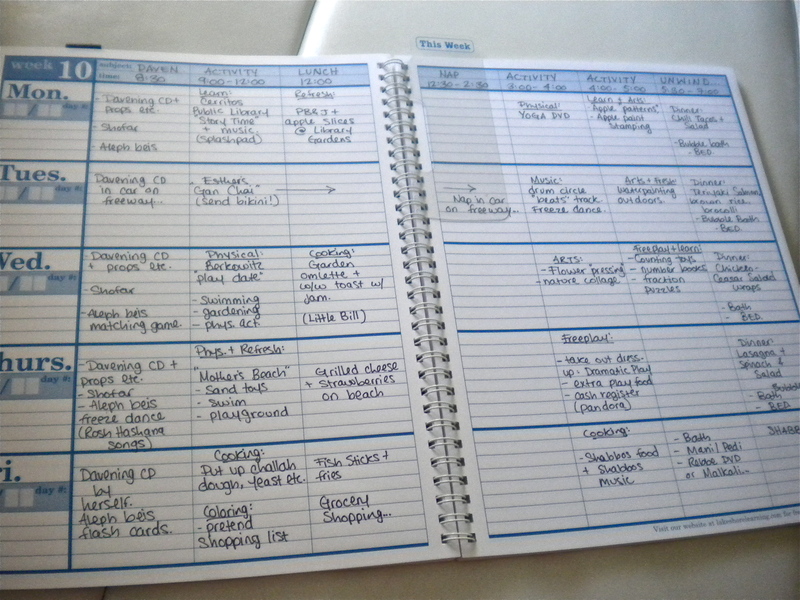 When I get the least bit frazzled, you'll find me sitting down with a pen and a paper - organizing. Dinners menus, shopping lists, article ideas, blog posts, art projects, holiday thoughts, to-do's etc. Naturally, if you're someone of this nature, lesson planning for your little ones will come to you a bit easier, but I really want to share this method with all of you, because I really feel very strongly that it will definitely help with work-from-home/stay-at-home sanity and increase your level of daily happiness. At the beginning of the month I jot down a small list of things I'd like to do/teach my child over the course of the next few weeks (e.g. Elul: king, crown, good deeds vs. bad deeds, scales/weight, wild flowers, shofar sounds etc.). 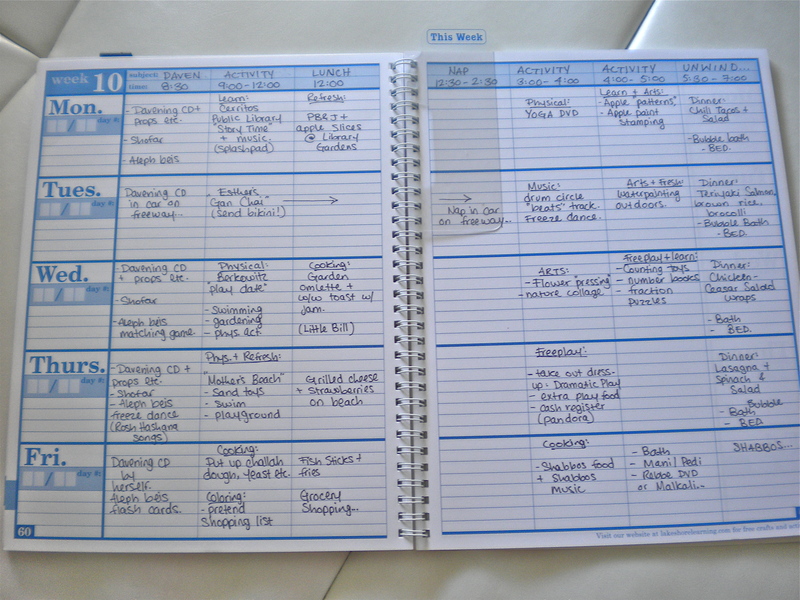 Then at the beginning of each week I plan out 5 days of learning and activities - with most hours accounted for. I generally keep her nap and eating schedule the same, so I mostly work around that. Also, I use a method of "frequent 4": Creative, Outdoors, Learning, and Moving (e.g. finger painting, park, letter recognition game, freeze dance). When I plan one of each of those catagories daily, it's generally plenty of activity and fills up my slots on most days. You wouldn't believe the ease of my days when I work this way! I know what we're doing, where we're going, what time I need to be back, what I need to pack etc. There is no thought process whatsoever! And Freida is so happy with her schedule - she loves the security of knowing what is coming, and getting used to not just the routine of it all, but the excitement of what's coming next. Aside from that, the trust I gained from her by almost always having something interactive to do with her means that when I need a free hour or so for myself, she happily complies with alloted "freeplay" slot in her schedule and genuinely leaves me alone. She knows and trusts that I won't ditch her for hours, and that when I do resurface we will do something else fun and exciting together (even if it's cooking dinner!). I know that this all sounds like extra work, but I promise the little time you put into planning at the start of the week makes it fly by with such minimal effort on your part - it's incredible! And that's all aside from the benefit your child receives, and the feeling of accomplishment that most full-time mom's admit to missing. Try it! !